Boko Haram, missing girls: Return possible, report says. 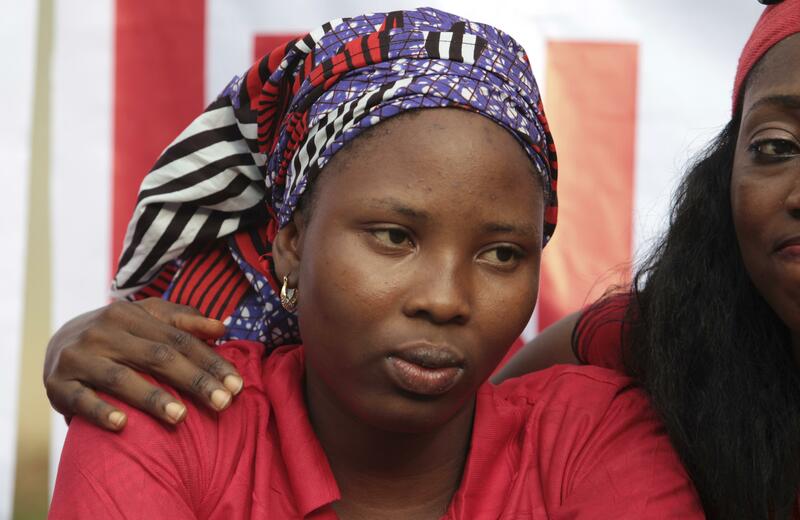 Isaac Rebeccca, who was kidnapped from the Chibok school but escaped, at a recent protest. “I wish to inform this audience that a ceasefire agreement has been concluded,” said the head of Nigeria’s military, Air Chief Marshal Alex Badeh, adding the deal had followed three days of talks with the militant sect. Government spokesman Mike Omeri said the deal covered the release of the captives and Boko Haram had given assurances “that the schoolgirls and all other people in their captivity are all alive and well”. Reuters cautions that it’s unclear exactly which Boko Haram representatives the government is negotiating with. Nigerian officials have rarely handled the group in a way that inspires confidence; at one point protests related to the abduction were banned, while the country’s claim that it killed Boko Haram figurehead Abubukar Shekau in 2013 are disputed, not least because Shekau was also said to have been killed in 2009.